The Vegas Robaina Familiar, discontinued in 2012, is a powerful and complex Corona, 5.6” (129mm) long, of 42 ring gauge, and comes in a 25 cigars box. The flavor profile is very similar to the other vitolas from the Vegas Robaina line up. There is a lot of creaminess, smoothness, some straightforward tobacco, some wood and cedar, coffee and chocolate. There are also notes of sweetness, molasses, nuts, leather and throughout the whole cigar some spiciness. The flavors work very well altogether; the cigar has no rough edges. The construction is as you want it, the burn doesn't require any attention, and it is a pleasure to smoke until the nub. The Vegas Robaina Familiar is a very good option for a rich Habanos that isn't too powerful. • Complex cigar, with creamy coffee flavors, notes of wood and of cocoa in addition to the dominant tobacco flavor. • More than 10 years of ageing helps developing the creaminess and smoothness of the cigar. This cigar simply delivers the best Vegas Robaina experience being that old. The cigar is looking good, with a slight-box press, and a dark silky wrapper. There are few apparent veins on the cigar, but the cigar is very well rolled. The cigar is very light and the wrapper is very thin. The triple cap is perfectly applied. The construction is also very good; it is pretty firm without any soft spots. The wrapper smells of earth, coffee, creamy chocolate. Upon cutting the cigar, the draw is a bit on the tight side, but it doesn't hamper the flavors to reach the palate. The cold draw gives some sweet chocolate and toasted tobacco. 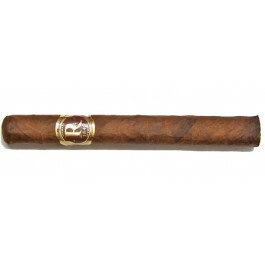 Once lit, the cigar starts off at a solid medium body, creating a generous amount of thick smoke. The aromas are right away typical Robaina, black roasted coffee with some sweetness and a bit of saltiness. The burn line is very good right from the beginning and does not require any attention. The first third of the cigar is pretty firm, the strength is a strong medium, but the flavors are very rich and smooth, they leave a nice creamy coat on the palate. The flavors are pretty sweet, with some molasses, creamy coffee, but also some delicious cedar flavors. There is also a good spice dimension to it, not overwhelming whatsoever, just a kick of pepper. The draw is still pretty tight, but the burn is great. In the middle third, the cigar is still gaining strength while the dominant flavors are of wood and roasted nuts. The spices faded, and leave ample space for some chocolate, cocoa and some grassy elements. There are also notes of dried fruits. Overall, the middle of the cigar is still very creamy and it beautiful. In the final third, the flavor profile is similar to the previous one, where the coffee is even more dominant and where the spice makes a comeback. The cigar is still pretty complex and also getting stronger, now a medium to full body. The cigar burns cool until the last inch where it has to be put down. In summary, it is a delicious cigar and the Familiar is truly from the Vegas Robaina family.